When I was very young, we used to have books of trading stamps. 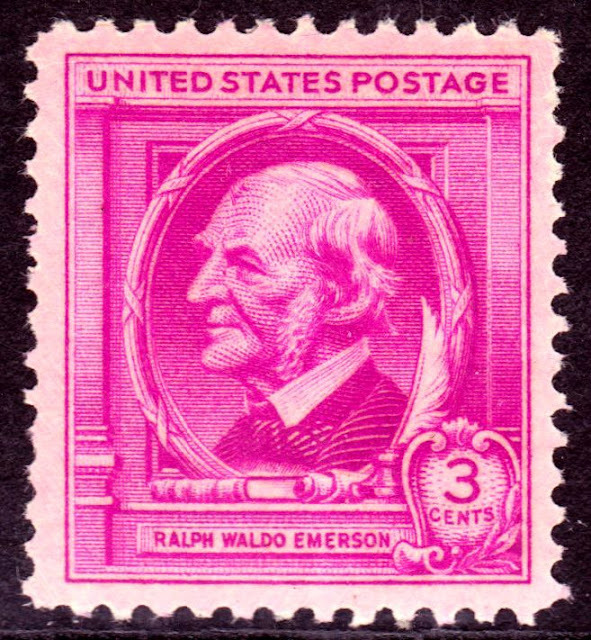 There were several varieties, but S and H Green Stamps were the most common. 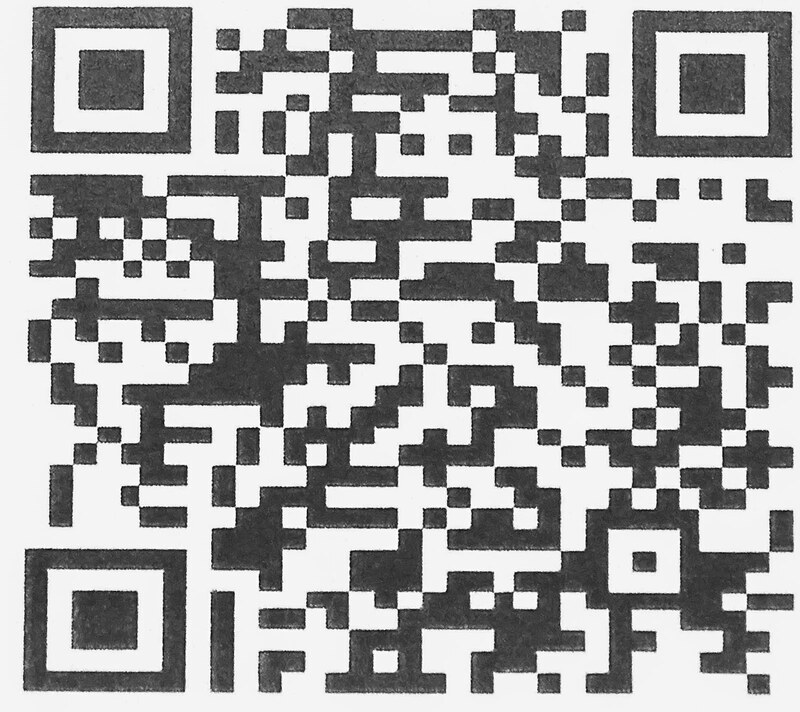 The idea persists today with the bar code cards many people carry around to obtain discounts from various merchants. We dutifully produce our bar code card although we aren't quite sure if we are getting anything in return. The difference with Green Stamps was that you could fill books of stamps and redeem them for actual products in S and H Green Stamp redemption locations or by mail. Well, I think genealogy, in some cases, has become a game of pasting names into a book to get some, usually only partially defined, benefit such as "connecting with our ancestors" or whatever. Don't get me wrong, there are real, fundamentally important reasons for researching our ancestors, but there is a level of genealogical activity that is more interested in filling in the blank spaces then deriving any real value from what is produced. How do we get away from the Green Stamp approach to genealogy? May I suggest that a significant step will be to begin critically examining the information we acquire. Unlike the generic nature of the trading stamp, our ancestors are not identical items to be pasted into an album or booklet. The real significance of the research comes at the point when you begin to realize that these were real people with real challenges and some significant problems. This realization only comes when you move beyond the superficial collection stage (aka the U.S. Census stage) and start to view your ancestors in their place in the vast sweep of history. In fact, it might be a good idea to start with your own place in history. I can certainly work at the collection level in genealogy but I also know when I have moved past being a collector into considering the reality of the people I am researching. I think this change comes when I stop looking at my ancestors as blank spots on a fan chart and start asking questions about how much I know about their lives and their circumstances. Perhaps, we all need to spend more time thinking about our ancestor's lives as real people. I can treat genealogy like a puzzle where I look for pieces that fill in the gaps, or I can think of my ancestors as people who lived and died with all the experiences in between where my job becomes understanding and documenting their story. How do I know this is an issue? When I am asked by researchers how many sources are needed for each person in their family tree. I spent most of my life being paid to essentially do research. The underlying motivation of all this research was to prove that my clients were right and another attorney's clients were wrong. Of course, the opposing attorney was trying to prove the exact opposite. Some genealogists treat their research as if they were trying to prove a point and as I have written many time before, they adopt a whole hierarchy of levels of ways to "evaluate" the "evidence" and prove their conclusions. Generally, they also have clients that they are trying to represent. When I first started to get really serious about genealogy, I too thought about representing clients and getting paid for my research. But after a very few experiences in "representing clients" I realized that the concept of advocacy in genealogy defeated the ultimate interests in discovering the past. Every historical document tells a story. If we get caught up in the legalistic evaluation of documents as primary and secondary, original or derivative, direct or indirect, then we a caught in the paradigm that at some point we are going to prevail and prove that we are right and the rest of the world is wrong. Maybe, we should look at documents as individual stories, some are more reliable than others, but each tells us something about the people we are researching. Maybe we will never know the "full story" but we can gather everything we can and come to our own conclusions. But if we ignore this crucial step of critical evaluation, we are shunted back to the level of collectors filling in empty spaces on a chart. It was interesting to me that after many years of conducting initial client interviews, I could tell rather quickly whether or not my potential client was telling me the truth. What was interesting, especially early on with criminal cases, was that after representing hundreds of criminal defendants, I only had two that I could remember who actually were telling me the truth and in one of those cases, my client was trying to lie to me. I distinctly remember one civil jury trial where I suddenly realized that my client was lying, the opposing client was lying and the opposing attorney was lying. I felt sorry for the jury. 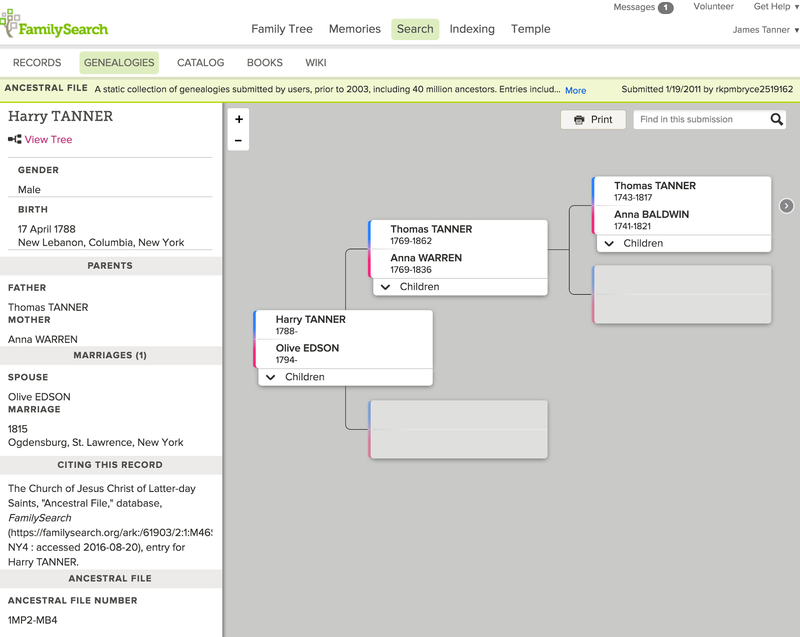 Let's look at a specific issue genealogical issue from the FamilySearch.org Family Tree for an example of critically examining the documents. Here is an individual I have been researching lately. I used part of this same family as an example in my last post. You can see that he was supposed to be born in "Wellwood Corners, Mexico, New York" and an exact date is recorded. Let's look at the sources so far. All of these sources except the Legacy NFS source were added by me. How do we know when James J. Wellwood was born? Well, the 1900 U.S. Federal Census document says that he was born in December of 1810. The 1850 U.S. Federal Census document indicates he was born about 1813. The FindAGrave.com entry indicates that his birth date is unknown. 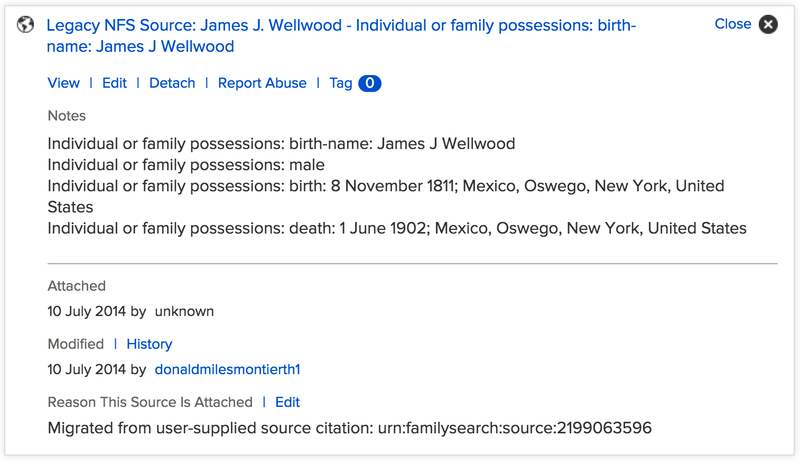 Lastly, the Legacy new.FamilySearch (NFS) source says that family records give a birth date of 8 November 1811 in Mexico, Oswego, New York. When and where was he born? The real answer at this point is we don't know. Does this matter? 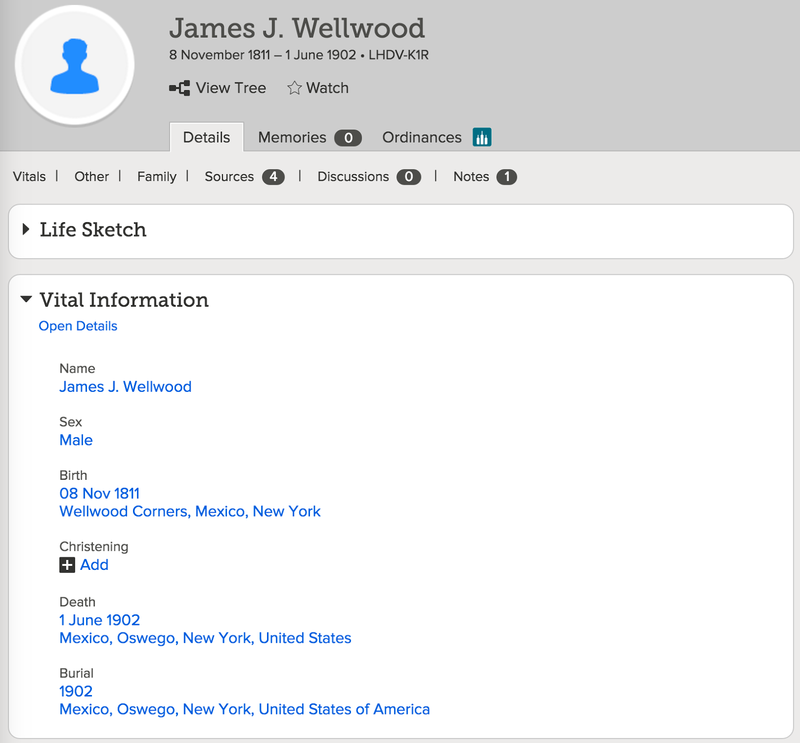 Did James J. Wellwood or Welwood really live? Does the fact that the FindAGrave.com website has a photo of his grave marker make any difference? Where do we go from here? 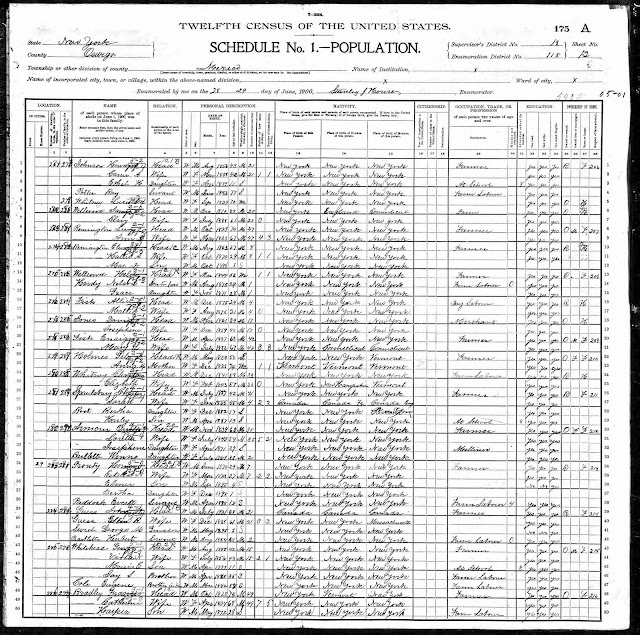 Here is what the 1900 U.S. Federal Census has to say. Here is the actual Census record. It might help to know that there is a place called Wellwood in New York and that there is note in the FindAGrave.com entry as follows: "Wellwood, also known as South Mexico, was named in honor of James Wellwood who settled there in 1838." From here the plot thickens as they say. Actually, the first Wellwood in the area was likely named John who arrived with his wife Esther Tanner Wellwood in Mexico, New York in 1838 from Rhode Island. 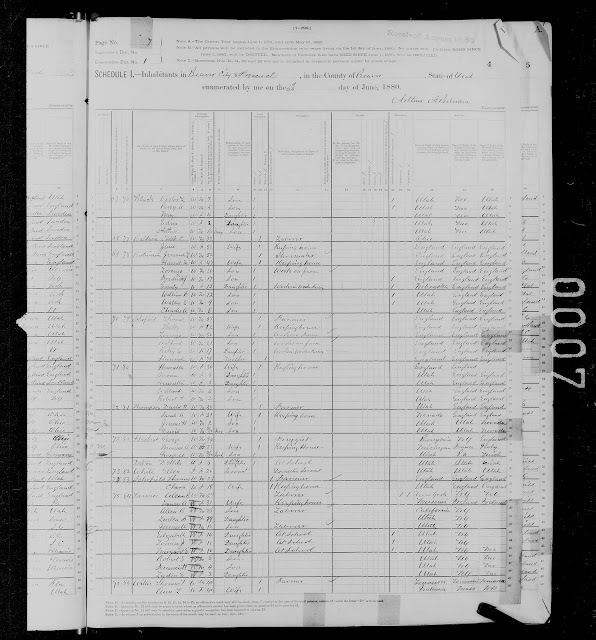 The 1900 U.S. Census shows that some one said that James's father was born in England and his mother was born in Connecticut. 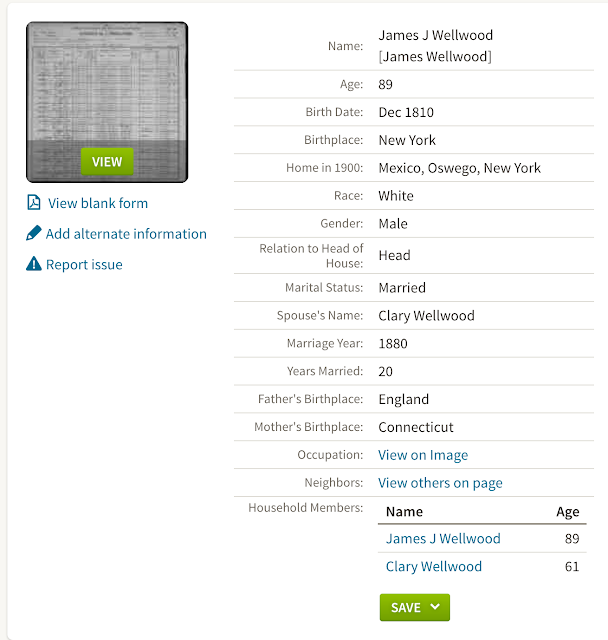 John Wellwood, James's father is recorded as being born in New York and his mother as being born in Rhode Island. OK, this is enough to illustrate my point. If I were just copying out the entries from these various "sources" it should be apparent that the family dates and identities would be an unsolvable mess. Somewhere in this mess, there is something reliable, but right now, a lot more research needs to be done. Could we fill in our stamp book with the names and dates we already have? Yes, we could but we are very, very likely wrong about most, if not all of the details and we are still not sure who these people were. Although we may never resolve some of the differences in dates, we can get to the point where we know about this family in a way that makes them distinctive individuals. Let's get real in our research. It looks like it is time to get going about genealogical sources again. Here is my definition of a genealogical source. A source is not a citation. Here is one definition of a citation. More precisely, a citation is an abbreviated alphanumeric expression embedded in the body of an intellectual work that denotes an entry in the bibliographic references section of the work for the purpose of acknowledging the relevance of the works of others to the topic of discussion at the spot where the citation appears. See Wikipedia: Citation. We often use the phrase, "cite your sources" to indicate that when you obtain information from somewhere, it is proper to let others know where the information came from. If we use some form of specific information without attributing the source, we are plagiarizing the source. When I quote someone or something, I indent the quotation and then provide a citation or a link to the original statement or source. I am not concerned here about the "form of citation" used by genealogists. 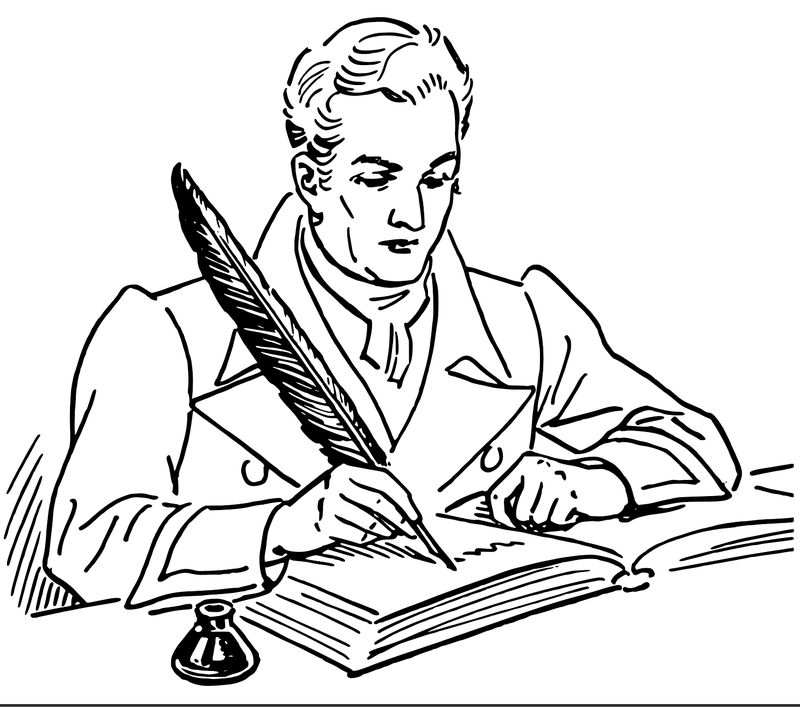 Most genealogists are not academically educated scholars and they are not writing for formal publication in a genealogical journal. Neither are they providing a professional proof statement to a client. But everyone obtains their information from somewhere even it is personal experience and we are entitled to know where they got their information. There is a measure of discussion among some genealogists about what is and what is not a proper "source." We get into quasi-legalistic arguments over primary and secondary sources and all such nonsense. The truth is that the artificial distinction between a "primary" source and a "secondary" source has been created to try and resolve the problem that all historical sources, no matter how they are derived, are subject to scrutiny and could be unreliable. Just because someone was there when an event occurred and recorded their impressions does not mean what they wrote or said was reliable. It is always possible that any particular witness to an event is lying. 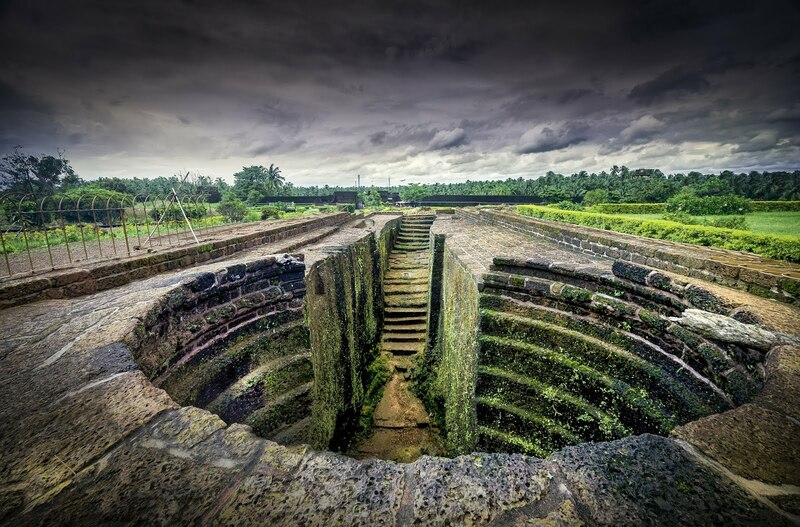 Why do we need to know where historical information came from? There are entire books written on this subject. Some genealogists in their zeal to provide "accurate" information tell people not to reveal their sources if the source was unreliable. For example, I have heard more than once that a certain type of record, such as a Family Group Record created by a family member or an index is unreliable and "should not be used as a source." Hmm. Personally, I would rather have you tell me you got your information from your aunt or from an index than not. The real problem is when information is entered and no mention is made of where that particular information was obtained. 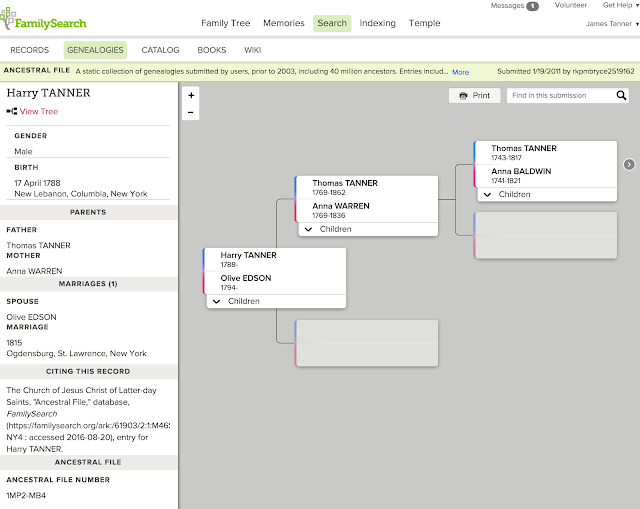 Here is an example from the FamilySearch.org Family Tree. Here, Sarah Remington is listed as having been married to two men, both with the same surname. The first entry is to a C. Wellwood and the second entry is to a James J. Wellwood. The first entry has an approximate marriage date and place, the second entry has no information about the marriage. Someone added the first entry and entered the information about the marriage but left no source information. So far, I have been able to document and cite the second marriage to James J. Wellwood with several sources. But I have yet to find even one reference to a marriage to C. Wellwood. If the person had simply told me that they copied the information from a Family Group Record, that would help me to evaluate the accuracy of the information. I don't really care at this point whether the person provided me with an academically acceptable citation according the Chicago Manual of Style, I would just like to know where the information came from with enough detail to find the source. Absent this source information, I have to spend my time trying to discover where the information came from and whether or not it is reliable. Even if the said they copied the marriage off of a gum wrapper that would at least give me an idea where to start. So let's get over this idea that we should exclude any source references at all simply because we judge them to be unreliable. Let's stop telling people that such and such is "not a source" and should not be included in a list of sources. If they got the information from from someplace we would consider to be unreliable we can disregard it. But it is always better to know than not know. But what about conflicting information? Wow, this is a loaded question. Let's not omit anything for the reason that we personally disagree with the content. My reaction to this type of message is automatic. I try to log in again by retyping the URL. I got the same results. I tried again to make sure. Most of this was done so automatically, I did not really think about it. Then I opened FamilySearch.org where I have a link to Ancestry.com and tried the link. Nothing happened. My next step was also automatic, but I had started thinking that maybe the website was really down. I did a quick online Google search to see if my inability to connect was local or general. There are websites that watch that sort of thing. One is "Is It Down Right Now?" www.iidrn.com. Here is a screenshot of the report. Yes, the website had been down for about 33 minutes. What do I do then? Start doing something else, of course. By the way, it came up in about two more minutes of waiting. The L3C is designed to make it easier for socially oriented businesses to attract investments from foundations and additional money from private investors.Unlike the traditional LLC, the L3C’s articles of organization are required by law to mirror the federal tax standards for program-related investing. A program-related investment (PRI) is one way in which foundations can satisfy their obligation under the Tax Reform Act of 1969 to distribute at least 5% of their assets every year for charitable purposes. While foundations usually meet this requirement through grants, investments in L3Cs and charities that qualify as PRIs can also fulfill the requirement while allowing the foundations to receive a return. This is your special invitation … to help thousands of people around the world find and connect with their family roots, and have your logo and website link placed on tens of thousands of desktops, tablets and other devices in over 140 countries! with a unique just-in-time learning model that is revolutionizing how people find and connect to their roots. In keeping with our mission statement, we have no advertising on our website. Still, we have ongoing business expenses that must be met. To address these needs, we are introducing our Sponsorship Campaign, which enables individuals, companies and organizations to donate to this important cause, as well as benefit from PRI's (Program-Related Investments) and tax incentives such as advertising deductions. To explain how this will work, here is a listed description of the process, again from the notice sent to me. A free website visited by people in over 140 countries. On the main Family Search portal page in over 4,800 Family History Centers and libraries, on over 10,000 desktops and thousands more personal computers worldwide. 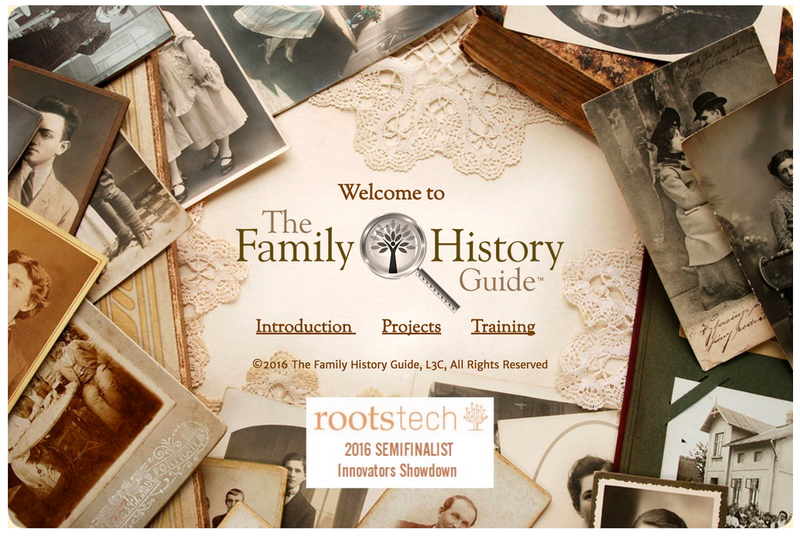 A semi-finalist in the RootsTech 2016 Innovator Showdown. Used for training family history consultants at the BYU Family History Library, the Riverton, Utah Family History Library, and many other libraries across the U.S.
A partner with Family Search, the largest free family history company in the world, and part of the Family Search App Gallery. Part of an L3C company that qualifies to receive PRI's from foundations and other organizations. A website where your logo may qualify as an advertising expenditure for your organization, company, or foundation. A company of all volunteers who do not receive compensation for their time or expenses. You or your organization can help us reach our goal of continuing to provide a free website that enables more people, worldwide, to succeed in family history. Your donation will receive special recognition on the The Family History Guide website: your logo will be prominently displayed and directly linked back to you, plus other benefits depending upon your participation level. Become an individual donor, partner or sponsor with The Family History Guide today! I do not usually get directly involved in fundraising efforts, but in this case, I am making an exception because of the inherent value of this free program. 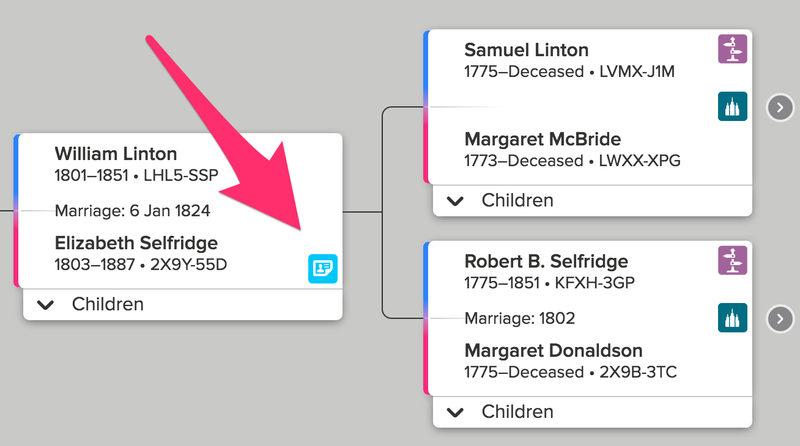 One of the most impressive, new genealogical technologies to emerge in the last few years has been the advent of automated searches that provide extensive record hints matching the individuals in your online family tree with original sources. Included in this expansive technology is the ability to suggest connections with others that share the same ancestors in their own family trees. All four of the large, online genealogical database programs have implemented this new technology and even extended it to some of their subsidiary websites. This rapidly developing technology has revolutionized the process of finding information about ancestral families for many users, particularly those with families from the United States, the British Isles and Canada. As the technology develops and more and more of the records are included in the automated searches, the process will become even more valuable to the genealogical researcher. In may cases today, especially for those whose more recent ancestors lived in the United States, sources are found identifying relatives back about 150 to 200 years with great accuracy. This outstanding technology began with record hints from Ancestry.com called the "Shaky Leaf Hints." 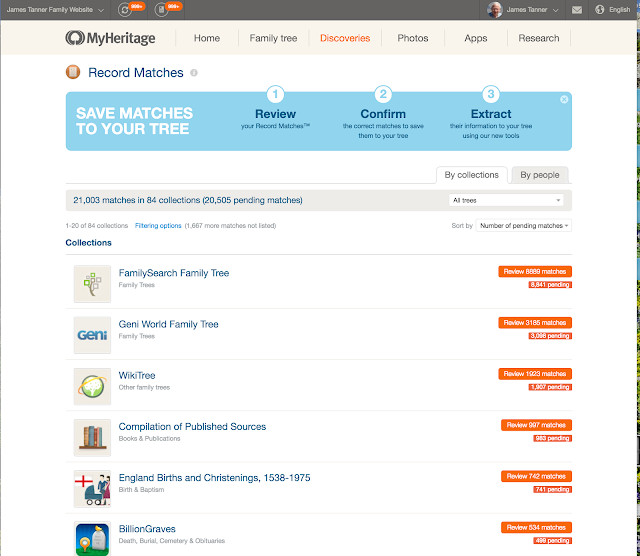 Significant, ground-breaking improvements to the accuracy and coverage of the technology were implemented by MyHeritage.com and subsequently, the other websites increased both the incidence and accuracy of their own record hints. The technology is not always 100% accurate and does take some level of evaluation by the user, but by and large it has measurably increased the overall accuracy of the content of the online family trees. The essential ingredient to facilitate this new technology is that the user enter some basic information into an online family tree associated with each website. Acceptance of the record hints has been dependent on the level of sophistication of the users. Many of the users of the websites have failed to add the sources to their own entries even though they are automatically provided and the process of adding the sources is relatively simple. There is also a significant level of resistance to the idea of maintaining more than one database, so if the user has a family tree in one program, there is a level of resistance in establishing another family tree in another program. Another rather interesting issue with the implementation of the record hints is the surprising and mistaken impression that many people seem to have that all of the large online, genealogical database programs have the same records. Each of the websites has its own unique records. Of course, the basic limiting factor of the record hint technology is that it only works with indexed records and each of the websites is limited to the records on the website. Fortunately for the researcher, the number of indexed records is increasing extremely rapidly. The method of marking the existence of a record hint varies with each of the websites. Here are some screenshots showing the various markers in each of the programs with an arrow indicating the icon indicating a record hint. The way the record hints are handled by each of the programs varies, but the principle is the same. The program suggests a record hint and the user is then called upon to evaluate the suggested source and attach it with the new information or individuals to the user's online family tree in that particular program. The one remaining challenge is the ability to adequately move the information found from one family tree to one in another program. There are a few possibilities but by and large source must be copies one at a time and the information added to the target family tree. 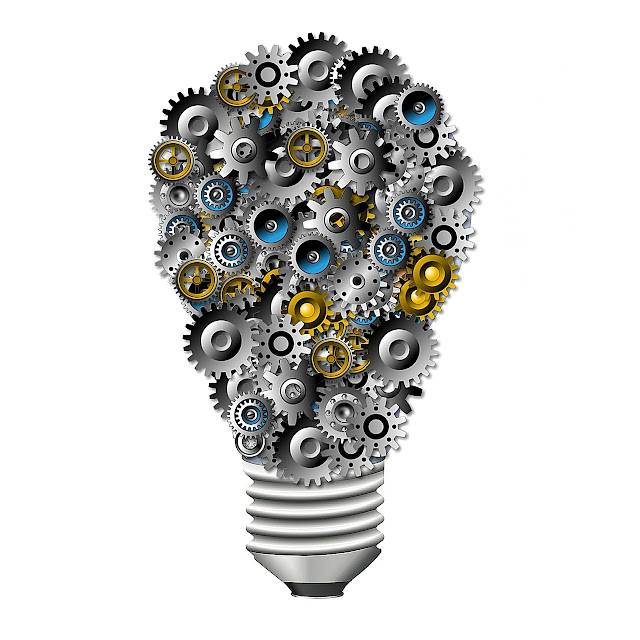 The user has to learn each of the methods of attaching and utilizing the information found for each website. In some cases, the number of record hints can be overwhelming but this only points out the fact that the technology is advancing rapidly and the amount of information being made available is impressive. Here is the previous post in this series. It is so simple and reassuring to find someone in a U.S. Census record. Between 1850 and 1940, it is almost a given that anyone in the U.S. can be found with a minimum of effort. Oh, you say, until you can't find them. Well, I found my Great-Uncle Allen Benedict Tanner and his family in the 1880 U.S. Federal Census by the simple expediency of reading through every page of the Census record in the small community of Beaver, Beaver, Utah. By the way, there are only 36 pages in that particular enumeration district, so it only took a few minutes to find the family. The problem is that when you can't find your family in the U.S. Census where do you go? What do you do? 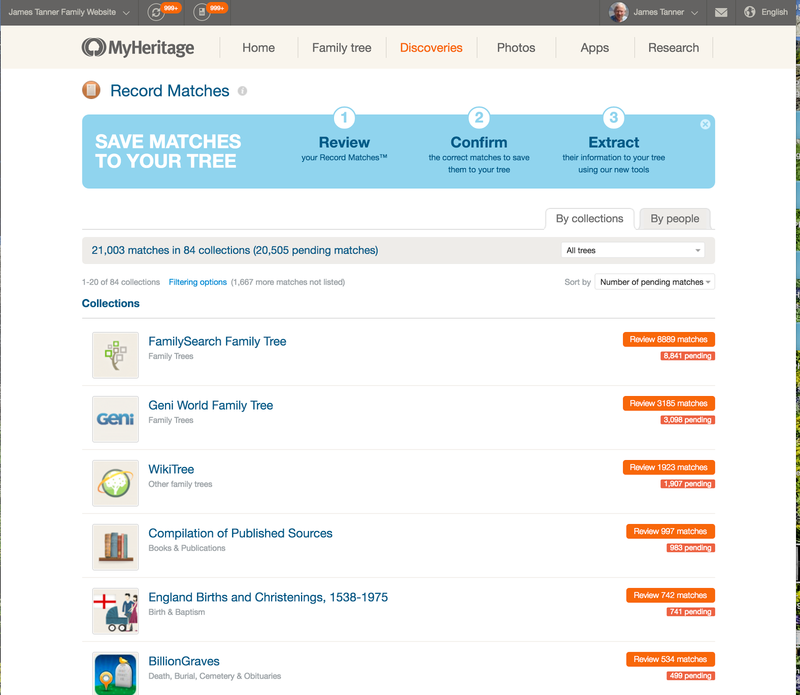 What if you also strike out with searches on FamilySearch.org and Ancestry.com? I should mention that when I tried to search on FamilySearch.org after I found the record by looking at every page, I did a search for "Allen B Tanner" in Beaver, Beaver, Utah and the search engine failed to find him or his family. So had I not already found him through the page by page search, I might have come to the conclusion that "he wasn't in the 1880 U.S. Census." This points out another important rule: always search the original records when they are available. In short, doing genealogical research is a lot more than census searches and finding a family in the U.S. Census is sometimes a lot more than a census search also. 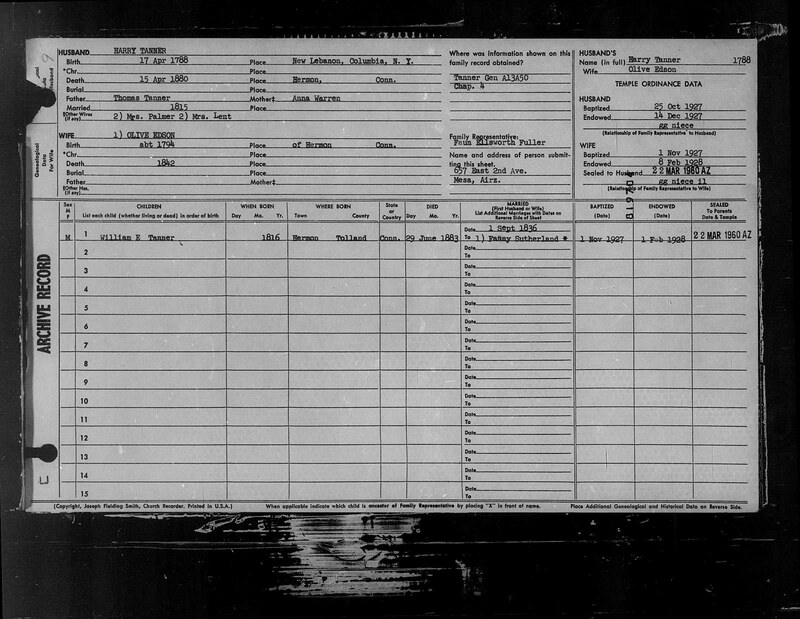 Did I mention that I found my Grandfather in the 1920 U.S. Census when he was indexed as "Tamer" rather than "Tanner?" The suggestion here is that there are lots of records about your ancestors other than just those in the U.S. Census. For example, Allen Benedict Tanner has twenty sources attached and I know that the number is only a fraction of the total number of places this particular Tanner family is mentioned in records. Just looking down the list already in the FamilySearch.org Family Tree, I could add in about three times that many sources if I had the time and inclination. But you say, so what? Who cares? And what difference does it make if there is one source or fifty? Genealogical research is not a numbers game. We are not out to set some kind of record for adding sources to a family. There are no extra points for each source added. So why not stop with the one U.S. Census record or so that establishes the family and leave it at that? By the way, this is a serious question and one that is posed to me regularly. I am regularly asked "How many sources is enough to add to someone in the Family Tree." My answer is always the same, "All of them." 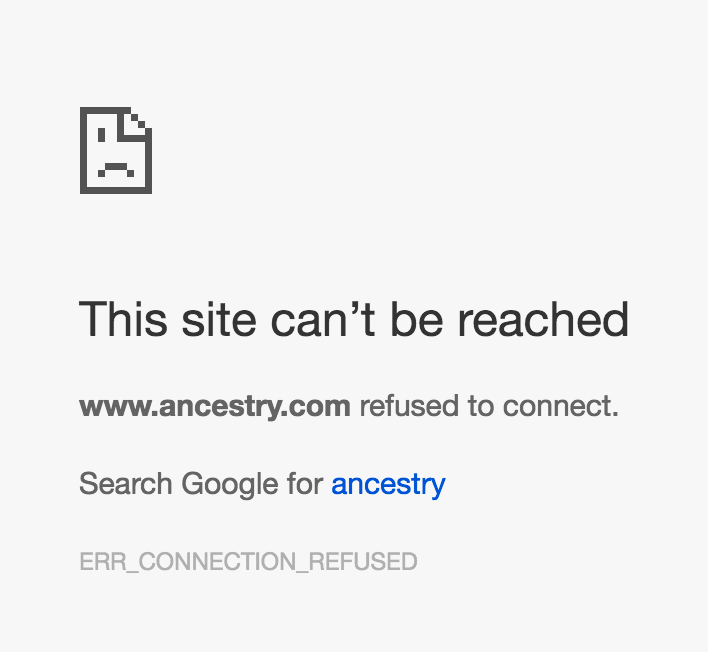 Just yesterday, I was getting frustrated with not being able to find a certain family in either FamilySearch.org or Ancestry.com. I did a general Google search and found an extensive biography of the father of the family with a long list of sources. 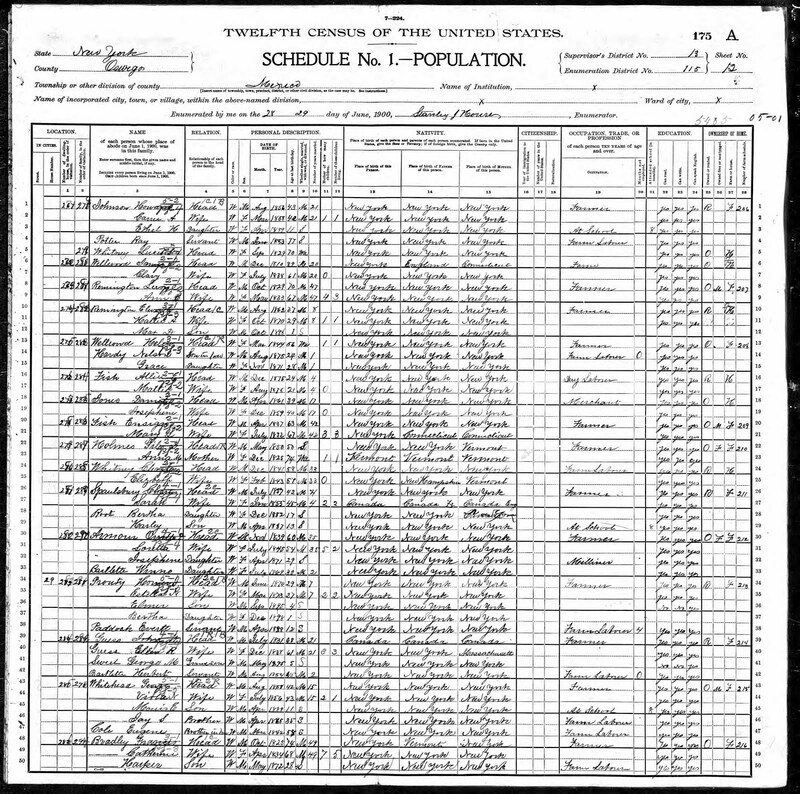 Is there a specific place to go if you cannot find an individual ancestor or family in the U.S. Census? Not really. The general rule is begin your search with marriage records as they are the most reliably recorded type of record. 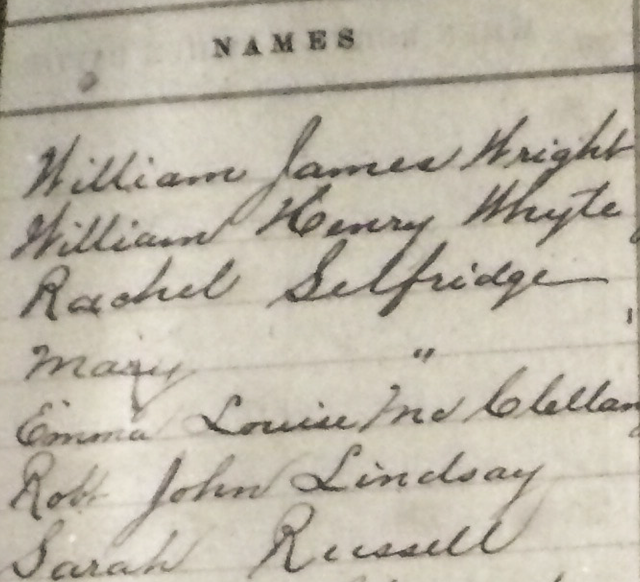 I eventually found yesterday's difficult family in cemetery records. I might also point out that you aren't through searching until you have looked at every type of record listed in the FamilySearch.org Research Wiki and the FamilySearch.org Catalog. I mean every single type of record listed. But usually, you can focus on church records or civil records to find most families. A recent local news article caught my eye, "Roy woman struggling to prove she's alive after government declares her dead." This story highlights a common problem faced by genealogists: conflicting source records. The Utah woman in the article has been fighting with the U.S. Government for over two years when the Social Security Administration reported her dead and her bank and other entities began to close accounts and try to collect for overpayment. From the genealogical standpoint, we commonly find names misspelled, dates incorrectly recorded, people wrongly identified and myriad of other errors that cannot be corrected and must be dealt with. The list of possible errors also involves simple issues such as the transposition of numbers in dates to the intentional understatement or overstatement of ages. It is also not too uncommon to find where record keepers were faced with or created outright lies. 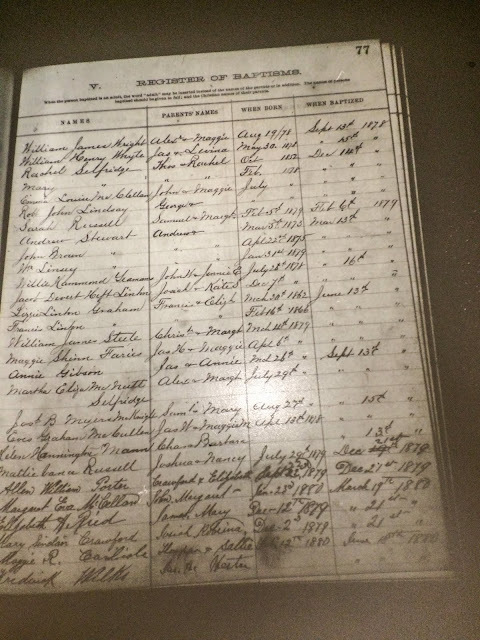 One of the most common issues and iconic for genealogists, is the fact that Census records are routinely off at least one year in the estimated age and birth date of the people listed. This is caused by the fact that the Census records are officially calculated from the "date of the census" which may affect the calculation of the age or birth date due to the actual date of birth being either before or after the official census date. Are you bothered by the inconsistency in the records? Do you ignore the fact that the records are inconsistent and adopt one record as the "correct" source or can you live with the inconsistency? Ralph Waldo Emerson is reported to have said, in part, "A foolish consistency is the hobgoblin of little minds..." Perhaps, we need to try to avoid foolish consistency and realize that historical records can be contradictory. Let's suppose that you find that a newspaper obituary and the grave marker disagree on the date of death. What do you do? Is there really any possibility or controversy as in the news article above, that the person is really dead? If not, then from a genealogical standpoint, what is the issue? One of the most important aspects of any form of historical research is to increase the breadth of our searches along with the depth. In the case I just cited, if the death date is crucial to identifying the right individual or for some other reason, then the answer is to do more research and find the will or the probate case in the court records. But if the actual date does not matter then why spend time trying to fight with inconsistency? Too many times, I find people who are obsessed with finding a particular date. I have one friend who has spent a huge amount of time trying to find a death date and place for a relative. Perhaps it is time to realize that he is dead and get on with other research. It is always possible that the date and place of death were never recorded for some reason such as the fact that he was lost at sea or wandered off into the desert or mountains and died. This whole issue points out the need for research that includes more sources than just one. There is wisdom in the admonition that in the mouth of two or three witnesses shall every word be established. See 1 Timothy 5:19. It is presumed that voice recognition software will replace the keyboard and the manual operating systems of all the world's computers in the future. 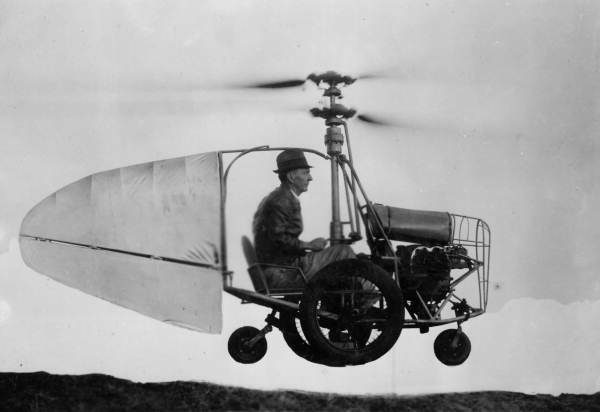 Well, they have also been predicting flying cars for about 75 years or so and we are really no closer to that reality than we were back in 1940 when this photo was taken. The problem with flying cars are similar to those with voice recognition. You can make one, but what you really need is a whole infrastructure of support and a system where the product can be used effectively. You might think that VR or voice recognition is a panacea for those who cannot adequately use a keyboard or a tracking device, i.e. mouse or trackpad. But in reality, the keyboard has one thing that VR has not and that is the ability to make quick and accurate edits of typos. Even if VR becomes so ubiquitous that it replaces the manual controls of common appliances, the range of commands needed to operate, say a microwave oven, are so simple and limited as to make the problem somewhat trivial. Genealogy is not simple and what we type and record is far from the directions to heat some soup for 30 seconds. As I have written in the past, I have been using VR for years off and on. There have been tremendous advances made in the accuracy and utility of the products, but for genealogists, we are just about at the very beginning of the development. Let me demonstrate the problem. Here is a rather simple quote from my family tree. Now, there are commands that could resolve a few of these issues, but the reality is that I can accurately type the entire entry in much less time, with a higher degree of accuracy than I am willing to spend trying to get the VR program to make all the adjustments and correct all the bad entries. It does not really help me to go back to the keyboard and try to correct the entries. The reality is that while I am typing, I am making a lot of mistakes. Most of those I can correct with one or two keystrokes. But with VR, I am forced to use a whole bevy of commands, most of which will end up making it ever harder to correct the final product. If I were simply writing a letter or an email, I could use the VR program and probable get as close as I needed to with only a few minor corrections, but that is not what I do all day. My operation of the computer involves a highly complex set of instructions that include a lot of clicking and dragging items from one place on the screen to another. To give oral commands to do something as simple as dragging and dropping an image and then formatting it, would require many commands and my frustration level would be enormous. Even if I had a quick and easy way to use VR to move from field to field in a genealogy program, how long would it take me to train the program correctly for every place name, i.e. changing from Huntingdon Shire to Huntingdonshire? As it is, I have an extra line feed in the second Burial entry above, that I cannot get rid of using the keyboard, how could I do the same thing with oral commands if I cannot do it with my keyboard and trackpad? To correct that formatting issue, I have to go into the HTML and edit it directly. Some years ago, a friend of mine had a car that gave audible, voice warnings. One particularly annoying warning said, "Your door is ajar." Of course, every time the car said that, we both said, "The door isn't a jar, it is a door." But you can begin to see the problem. Language usage is highly complex and even if computers get to the point of functioning like they do in some movies, they will still be annoying at times and blatantly wrong at other times, just as humans are. VR is a wonderful tool but we have to realize that just because something is useful in one way or another does not mean that it the universal replacement for everything. I recall the scene in Star Trek IV: The Voyage Home when Scotty is confronted with an old Macintosh computer. He talks to it and of course it doesn't respond, so he says "The keyboard, how quaint." But I am guessing that he would have had a very difficult time entering some complex commands solely using VR as demonstrated by the furious typing that ensues in the movie. By the way, the old Mac would not have the computer power to process the commands that Scotty was trying to enter. In making these observations, I am not disparaging VR. Here is the last paragraph of my post, entirely using VR. As genealogist, we need to be open to new technology and adapted [adapt it] to our working methodology. We also need to realize, that not all new technology translates into advantages for accomplishing our genealogical goals. 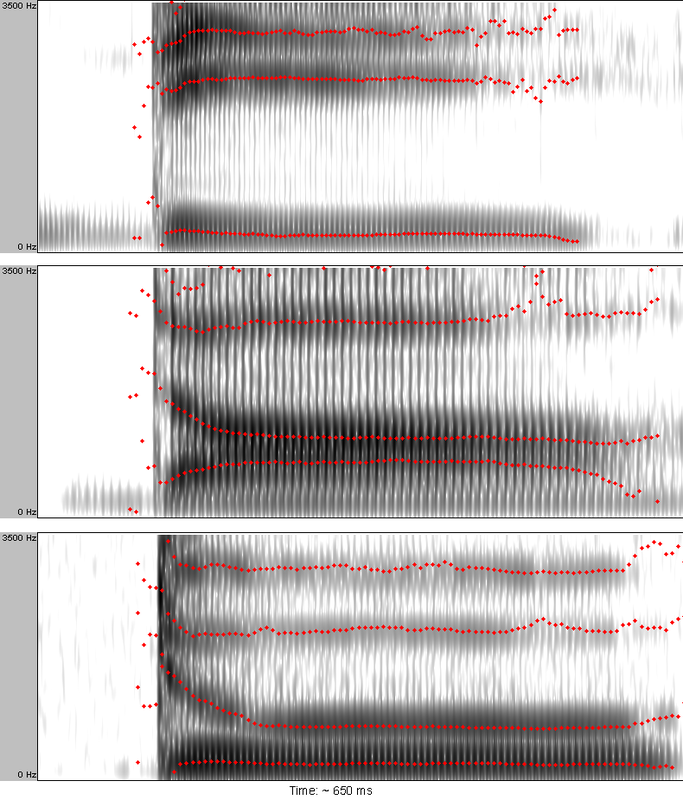 Voice recognition is a powerful tool but it is not quite ready to take over the entire child [field] of interfacing with a computer. Now, after dictating that paragraph, I went back and made the corrections which are shown in brackets and in red. The errors were real words and not caught by the spell checking capability of my computer. When the spell checker or, in this case, VR substitutes real words, making the corrections much more difficult to detect the typos and make the corrections. My last note. VR usually refers to "voice recognition." But recently, it is coming to more commonly refer to "virtual reality." Even this type of confusion makes using both types of VR difficult. My first blog post on Genealogy's Star blog was two short paragraphs about the FamilySearch Research Wiki. Since that small beginning, I have written and published 4468 posts and have kept writing now for almost eight years. When I wrote that first short blog post, I had no idea how extensively writing online would affect my life. Genealogically speaking, I have come a long way since that first, very tentative, offering. Probably the most interesting part of the whole experience has been meeting so many wonderful people. Of course, if you know me, you realize that if I am not writing, I am probably talking. So one of the spinoffs of the writing experience has been teaching a steady stream of classes and presentations. As an additional benefit of writing this blog, I have been asked to participate as a blogger at the annual RootsTech conference in Salt Lake City, Utah. Now, that we live in Provo, about an hour south of downtown Salt Lake, it is not quite as much of a production to attend the conference, but it is still a highlight of the year. My participation has turned out to involve the entire week of the conference, starting with the Brigham Young University Family History Technology Workshop on Tuesday and the Innovator Summit on Wednesday. This next year will probably be even more interesting than past years. The past two years, I have concentrated more on writing and meeting than presenting, but I have still had a constant schedule of meetings during all of the conferences and parts. Just as a side note, you may want to go to RootsTech.org and keep updated on the conference scheduled for February 8 - 11, 2017. Hotel rooms tend to fill up for the conference and it is a good idea to plan way ahead. Of course, the most dramatic change that has come in part from my involvement in genealogy is our move to Provo and my involvement with the Brigham Young University Family History Library. I have seven additional live, online webinars to present in September, 2016 and the spin off of this constant stream of webinars has been even more far reaching than the blogs. By posting the webinars on Google's YouTube on the BYU Family History Library Channel, I have seen a steady increase in the impact of this more immediate media outlet. One interesting side effect of moving to Provo was that I almost completely stopped being invited to speak at conferences around the U.S. and Canada. In reality, that turned out to be a benefit, because now, I spend my time writing presentations for video output. But I have been involved in a lot of local conferences, in fact, both my wife and I are teach three classes each this Saturday for the Provo Grandview South Stake here in Provo. Now another word about the name of this blog. If I had it to do over again, I would probably choose a different name. I was mostly thinking of an analogy to a guiding star or the sense that the term "star" is used by newspapers, particularly in Arizona. But I soon was embarrassed to realize my choice was somewhat presumptuous, but by that time, I was committed with the name and ran with it. Well, here we are, still writing away. You would think I would run out of topics, but in reality I have long lists of topics to write on that I haven't had time to get to yet. When I run out of things to say, I will let you know. A multitude of devices from digital cameras to smartphones, tablets and other computer devices can take images of documents for research and store them or share them with your other devices. This is only a very partial list of all of the marvelous technological helps that are now available or are becoming available. I am going to start with something very basic: digitizing our paper records. 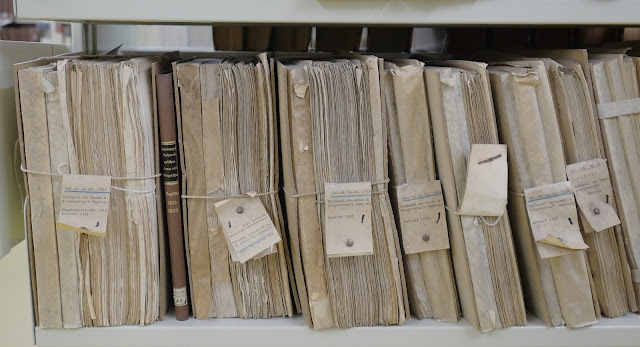 The advantages of having digital copies of our paper records may not seem evident to those who are not "connected" in the current sense of the word. Although the image would not be considered to be "archive quality," it is readable and very useful. I could get better images with a better camera, but the iPhone camera was the one I had with me when I was doing research in the Family History Library in Salt Lake City, Utah. We may find ourselves in a situation where we find genealogically interesting documents or records, such as a chance visit to a cemetery or archive, and we can use this new technology to take photos on the spur of the moment. Shoebox turns your iPhone or Android into a high-quality photo scanner. With Shoebox, you can quickly scan paper photos, add important historical information like dates and places, and upload directly to your Ancestry.com family tree. Editing dates, places, tags, and captions is easy. After you’ve cropped a photo, you will be taken to a “Edit details” page. Use the icons at the bottom to tag family members, date your photo, add a location, and write your own description. Store memories for free forever, deep within the FamilySearch vaults. Pick up where you left off on any device since the app automatically syncs to FamilySearch.org. Take family memories wherever you go—the app works even without Internet access. Snap photos of any family moment, such as recitals, dates, graduations, reunions, and memorials, and add them to your family tree. Use the app to take photos of old photos and documents too! Use the app to interview family members and record audio details of their life stories and favorite memories. Write family stories, jokes, and sayings with the keyboard, or use the mic key to record what you say. Identify relatives in photos, stories, and recordings to add those memories automatically to their collection in Family Tree. There are several other such convenient programs that can add this functionality to your smartphone. Stay tuned for the next installment in this series. 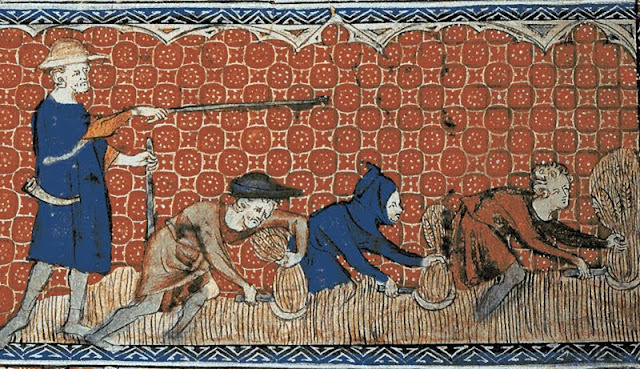 One of the realities of history and genealogy is that there are a lot more common people than there are rich, famous or royalty. The American fascination with royalty has hardly diminished. I can trace back almost every one of my family lines on the FamilySearch.org Family Tree and eventually someone has connected that family line to a royal line in Europe. 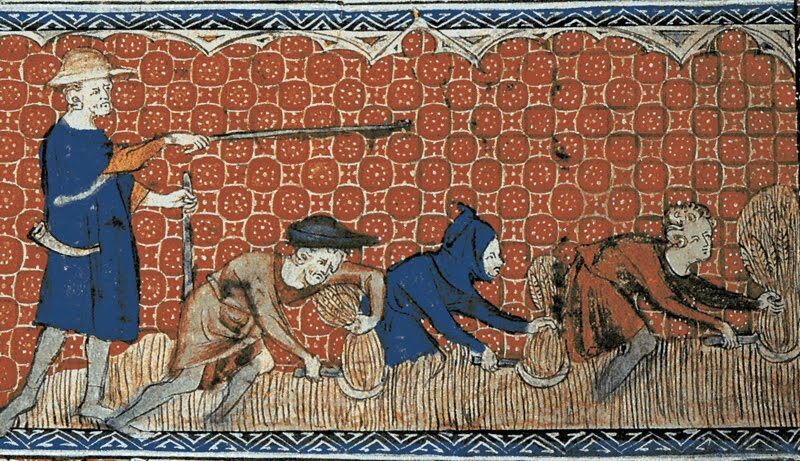 However, careful review of the English census records usually reveals that my ancestors were tradesmen or "Agricultural Laborers" and had no claims to royal descent. This topic came up recently when I traced one family line to a widow in the English Census who was identified as a pauper and the widow of an agricultural laborer or "AL." For some reason, it touched my heart that my own ancestors had suffered so much deprivation and poverty. But it did explain why they ultimately immigrated to Australia. If the immigrant in your family is a valid gateway, you are on track to documenting royal ancestry. If your immigrant is not on the list, the royal lineage presented to you is probably underproven or false. I might mention that this whole concept goes to claims of descent from an "Indian Princess" also. But in that case, I would suggest a comprehensive DNA test before you start trying to prove you have access to living on an Indian Reservation. Personally, I am becoming more and more impressed with the tenacity of my poor and very common ancestors who apparently survived the difficulties of being agricultural laborers and became my own ancestors. Genealogy is not immune to movements, fashions and fads. Some of these turn out to be beneficial to individual genealogists, others not so much. In the past, a considerable amount of the genealogical effort went into compiling "surname books," the generic term for compiled family histories that either detailed the descendants of a remote ancestor or the ancestors of a more recent person. Many of these books were compiled from "personal information" or undocumented sources. I have at least five of these family history books about branches of my family tree and none of the five cite any significant number of sources. Errors in these publications have proliferated into the current crop of online family tree. Until quite recently, the concept of documenting the sources of information referred to in compiling a family tree was almost completely missing from in the entire genealogical community. In fact, adding sources was actively discouraged by the paper forms used to record family information. Here is a screenshot of a "family group record" actively used for recording research between about 1940 and the present day which I selected at random from the FamilySearch.org website Historical Record Collections. I certainly don't fault the people who were compiling and submitting these forms for their lack of documentation. Here is a close up of the section allowed for source citations. 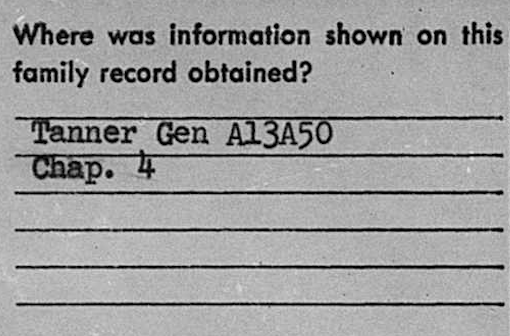 The number for the item identified as a "Tanner Gen" does not appear in the FamilySearch.org Catalog. The number is very likely as modified form of a method of marking the relationships of the people in a book to the beginning or most prominent individual. The point here is that this old, and still commonly used form does not encourage documentation and the documentation that was provided is entirely insufficient to identify the source. Some of the more sophisticated genealogical researchers used the backs of the forms to type in a list of sources; but this rarely happened. It would be impossible to accurately determine how many of the now-existing, online family trees owe their genesis to these undocumented family group records. As far as I know, the individual shown above, Harry Tanner, is not my relative. There are several unrelated Tanner families in the United States from England and Switzerland. By the way, there are over 2,500 individuals named "Harry Tanner" listed in the FamilySearch.org Family Tree and incidentally, there is no such place as Hermon, Connecticut where the wife is supposed to have been from. I did find a reference to this same Harry Tanner in an Ancestry.com family tree and the source for the information was listed as the Ancestral File, a compilation of these same family group records. So the cycle is repeated. The original reference is in an undocumented surname book which is then copied to a family group record and then incorporated in the Ancestral File which is used to add the individual, unchanged, to an online family tree on the Ancestry.com website. 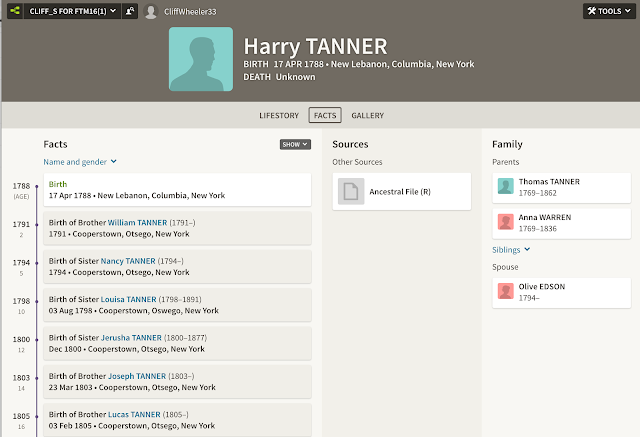 Here is the entry for Harry Tanner from the FamilySearch.org Ancestral File. 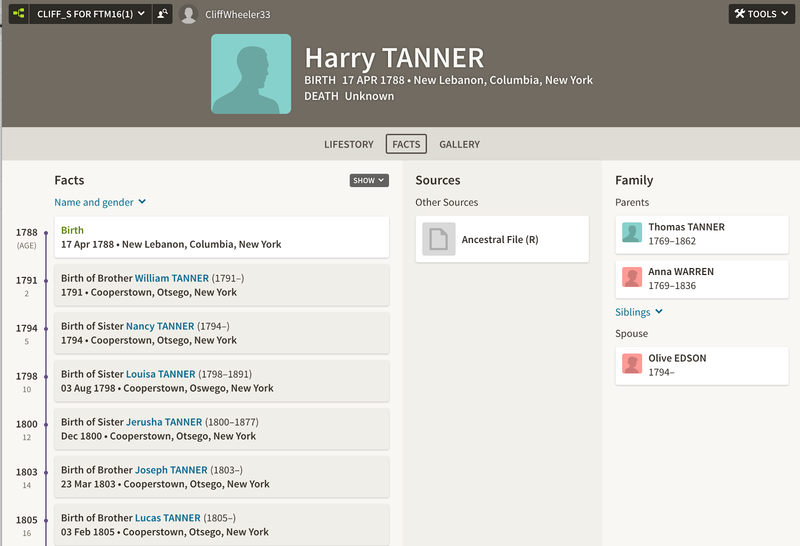 The Church of Jesus Christ of Latter-day Saints, "Ancestral File," database, FamilySearch(https://familysearch.org/ark:/61903/2:1:M46S-NY4 : accessed 2016-08-20), entry for Harry TANNER. If I were to believe this undocumented entry, I would find that indeed Harry Tanner and I are related as the pedigree shown in the Ancestral File goes back to our common ancestor. 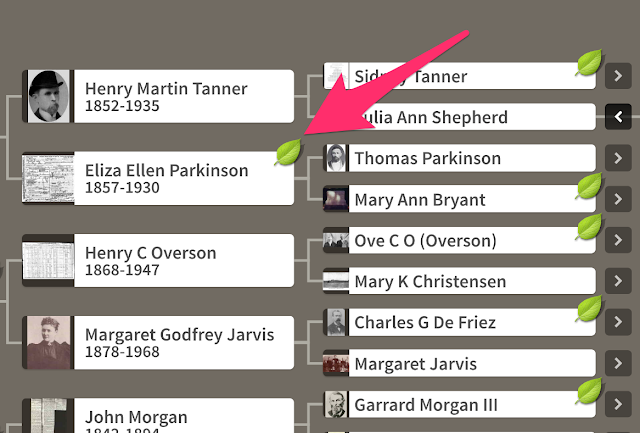 Unfortunately, the entries in the FamilySearch.org Family Tree about this common ancestor are presently duplicative and unsupported. In fact, as it now stands, the descendants of the common ancestor do not include this particular family line. To date, there is no documented connection between the early, colonial Tanner family in Connecticut and my Tanner family in Rhode Island. This phase of genealogical research in which documentation was almost uniformly lacking is still with with us. 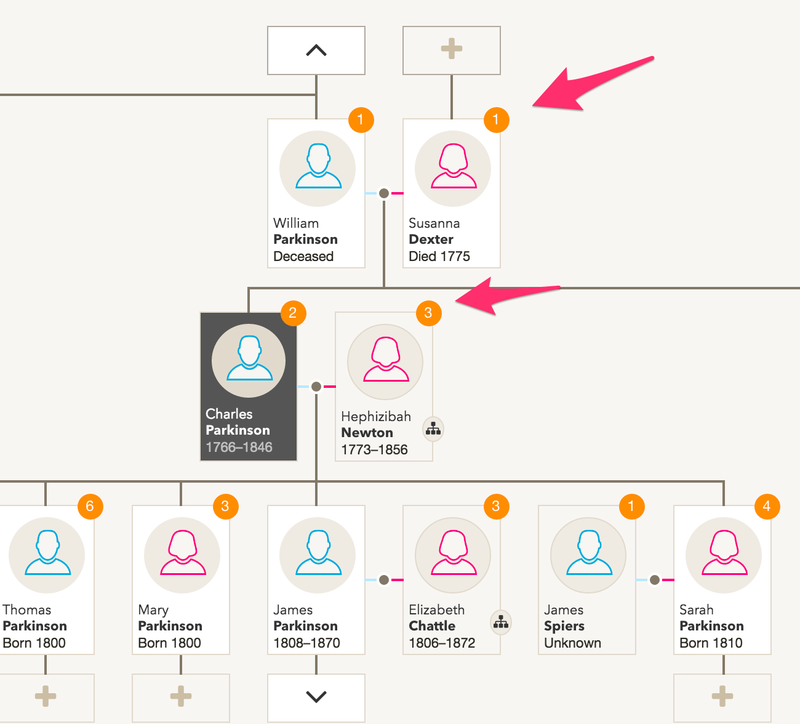 As I have noted on many occasions, most of the online family trees are lacking in documentation and as I have demonstrated, the origin of some of the information is highly unreliable. The idea behind this series is to examine the present cultural attitudes and physical limitations placed on researchers who wish to adequately document their research. For many years, the FamilySearch wiki allowed open editing for everyone. In recent weeks, however, the wiki has been plagued by spammers taking advantage of this system. The wiki team is now asking that you register as an editor by filling out a simple survey form. You will be cleared by the wiki team and given editing rights. The process may take up to 48 hours but probably will be much quicker. Find the survey form by clicking the link in the orange message at the top of any wiki page. 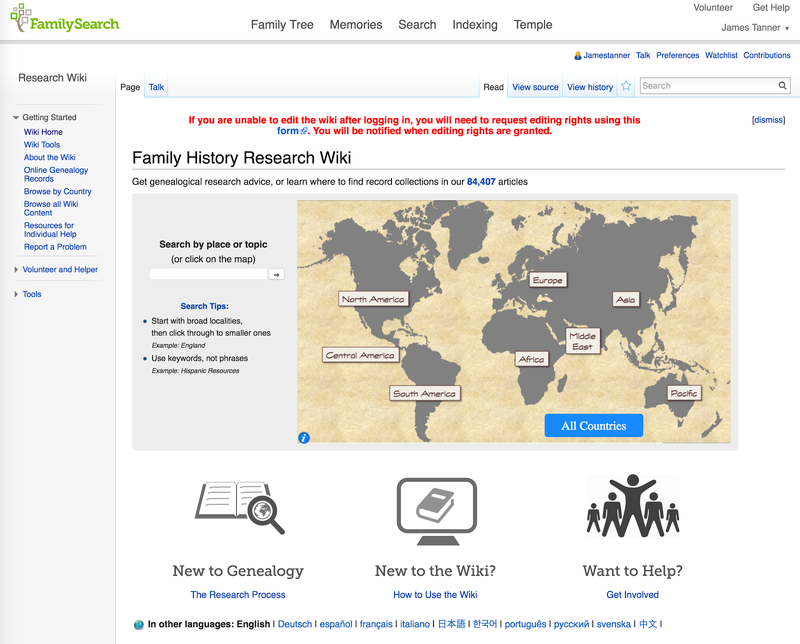 Please remember to keep your family history center FamilySearch wiki web page current! 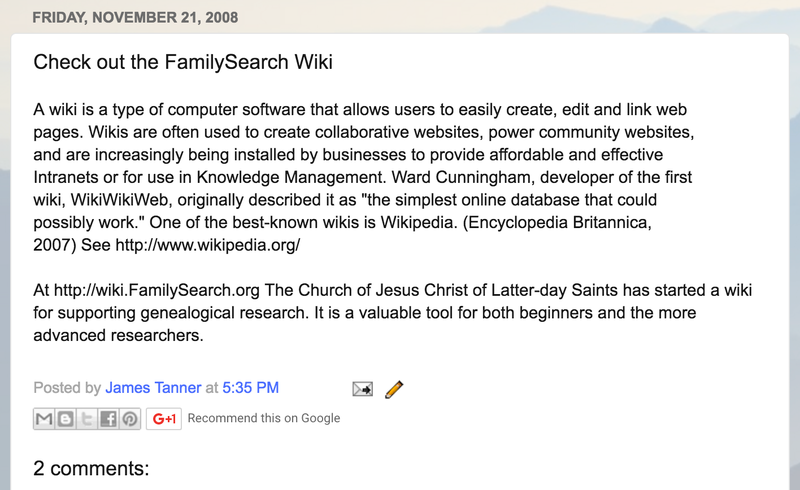 If you need help with your web page, contact wikisupport@FamilySearch.org. 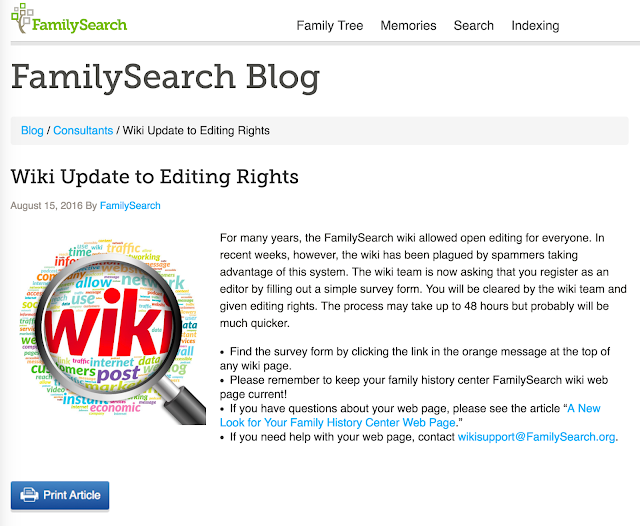 I might point out that the Research or Family History Wiki has always only been open to editing by registered users of the FamilySearch.org website. I might also point out that the Family Tree is also a wiki based product and some of us believe that some of the additions to the Family Tree also constitute "spam" in a general use of the term. If both programs want to maintain their integrity in a highly politicized and religiously persecuted world, then controls on the contributors were and will be inevitable. Maybe it is time to examine the "contributions" of the "registered" users of both programs? The following notification has been put on each of the pages of the Family History Research Wiki. If you are unable to edit the wiki after logging in, you will need to request editing rights using this form. You will be notified when editing rights are granted. Not too long ago, I wrote a post about the fact that most of the contributing and editing of the Research Wiki was moving "in house." In response, I got a series of protestations that editing and contributing were still open to the general, genealogical community. However, communication regarding the Research Wiki has become entirely internalized in an "invitation only" Yammer forum. Currently, the number of active users or contributors has crashed to just over 200 in the last 30 days. In the past the number has been close to 1000. The value and content of the Research Wiki have not been diminished at all by this lull in activity. I am guessing that most of the slowdown in activity is a result of the fact that adding useful information that is not already present is getting to be a much harder task and requires a much higher level of expertise. As a side note, I am expecting the FamilySearch.org Family Tree to go through the same cycle of activity. 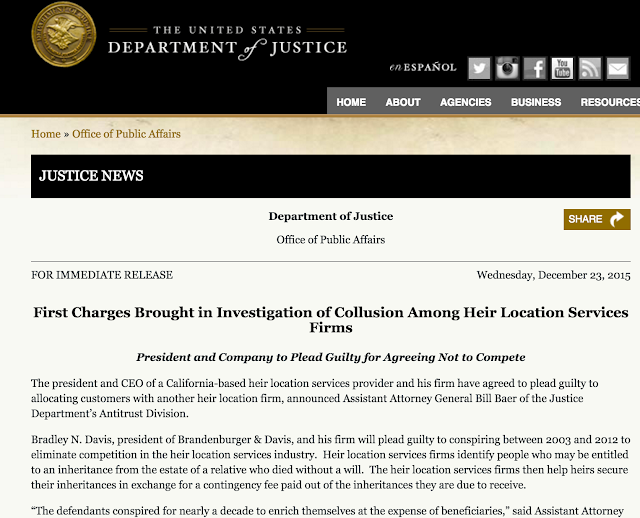 Bradley N. Davis, president of Brandenburger & Davis, and his firm will plead guilty to conspiring between 2003 and 2012 to eliminate competition in the heir location services industry. Heir location services firms identify people who may be entitled to an inheritance from the estate of a relative who died without a will. The heir location services firms then help heirs secure their inheritances in exchange for a contingency fee paid out of the inheritances they are due to receive. Brandenburger & Davis has agreed to pay an $890,000 criminal fine for its role in the conspiracy. In a separate plea agreement, Davis and the Antitrust Division have jointly agreed to allow the court to determine an appropriate criminal sentence. In addition, both the company and Davis have agreed to assist the government in its investigation. The charge was filed today in the U.S. District Court of the Northern District of Illinois. The terms of the plea agreements are subject to approval of the court. The allegations stem from a Justice Department investigation into anti-competitive practices in the industry in which companies track down distant relations when someone dies without a will or close family. Workers sift through probate filings in search of recently deceased people who may have missing or unknown heirs. For competitive reasons, details of the estate are typically withheld until the heir signs a contract with the company. The firms then use court records, genealogical documents and other public data to help them secure the inheritance in exchange for part of the assets. The industry defends its practices, saying it has helped heirs secure millions of dollars in inheritances they otherwise would never have known about. Even though I practiced probate law for many years and represented clients in probate cases, I never had the need to employ one of these companies. The appeal of this type of investigation is in representing very large estates where the recovery would warrant a sizable fee. Those who perform heir investigation services do not have to be attorneys neither are they regulated. Although this type of antitrust action may result in their regulation by the government in the future. This is a rather rare occurrence, when a genealogy-related activity makes the national news. I has been some time since I last wrote about the History.org website maintained by the Colonial Williamsburg Foundation. This website is a good example of the type of online resource that is unknown to genealogists in general and almost never referenced in genealogy conferences. I have found that nearly the entire genealogy community is woefully nearsighted when it comes to online and library resources. Not only does Colonial Williamsburg have a significant number of online resources, it has an extensive library, the John D. Rockefeller Jr. Library. 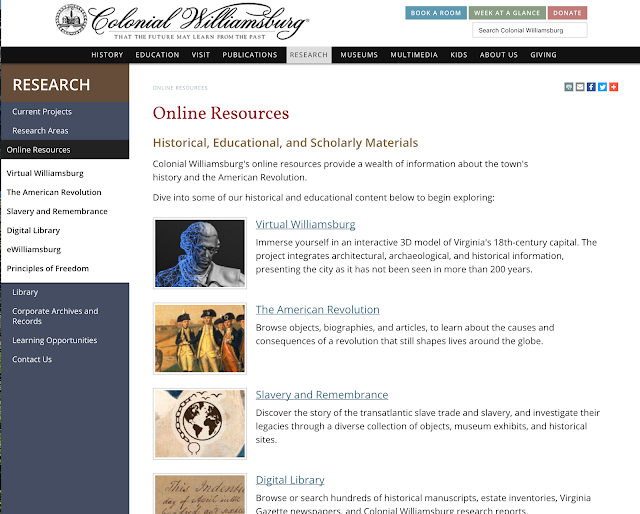 If you are doing colonial research or looking at ancestors in Virginia, you need to be aware of the expanded opportunities that exist in public, university and private libraries. 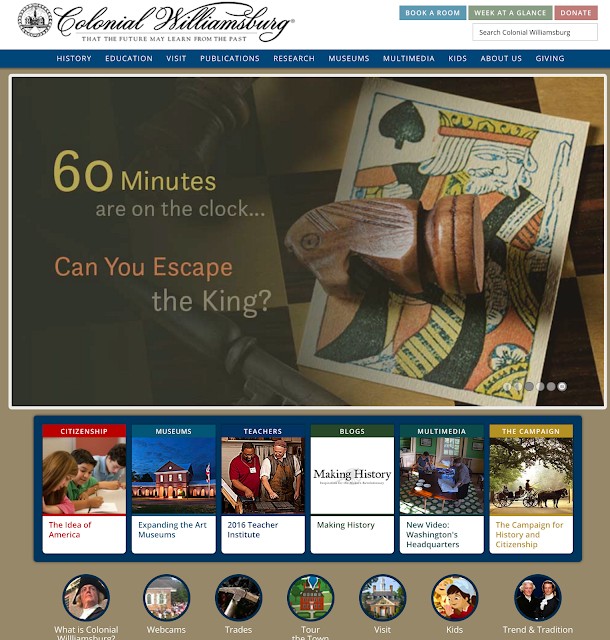 Additionally, the Colonial Williamsburg Foundation has expanded their educational opportunities. See the following article for a more detailed explanation. 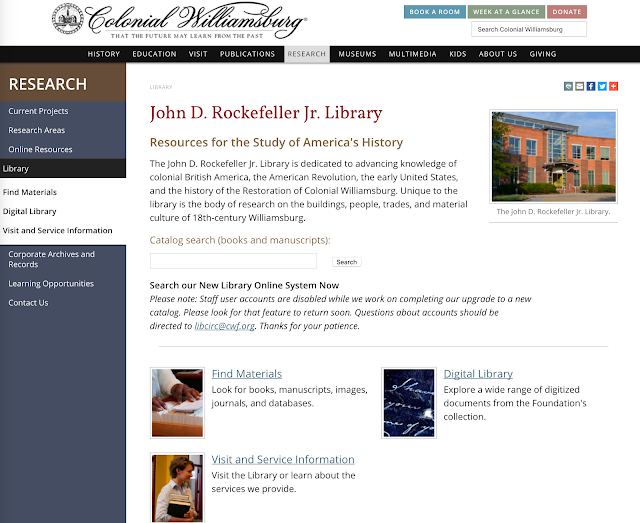 OUR ONLINE HISTORY LIBRARY IS NOW YOURS FOR FREE! 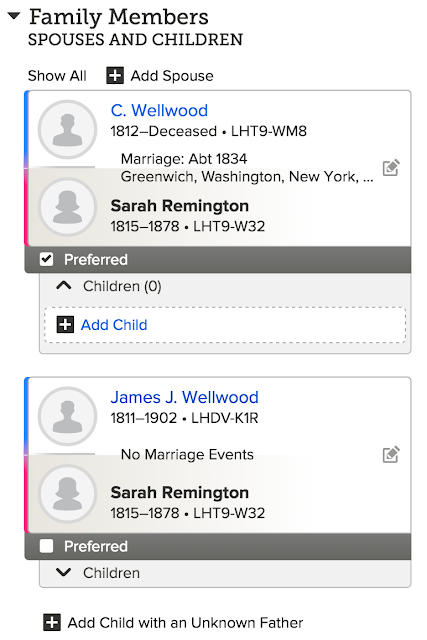 Genealogists in general are not early adopters as is shown by the discussion about the old Personal Ancestral File program that ensued as result of my recent post. But your individual attitude towards technological change has almost no effect on the changes. 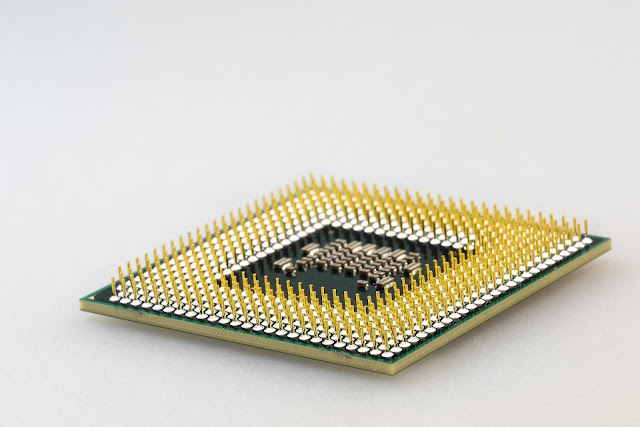 One of the most pervasive mechanisms driving computer technology today has been the Intel's constant upgrading of their chip sets. Once again, Intel has announced a new generation of chips to be introduced in the Fall of 2016, the seventh-generation code named Kaby Lake. As a result of the upgraded chip set, you can also expect the major operating systems such as Windows and Mac OS X to be upgraded. What does this mean for most genealogists? Probably not much. But as the computer chips continue to evolve and the Internet programmers take advantage of the new offerings, older computers will at some point no longer be able to run the newer software as it is released. See "Intel’s 7th Generation Kaby Lake Core i7-7700K CPU Leaked – Core i7-7500U and Core M7-7Y75 For Mobility Detailed." To add a little more interest to the tech changes, Google is apparently developing another new operating system code named, Fuschia. Speculation is that the new operating system may or may not replace the present Chrome and Android operating systems. See "What is Google Fuchsia?" You might want to note that the Google Chromebook computers do not run any installed genealogy programs since they only run programs that are online on the Internet, that includes Personal Ancestral File. Google is also in the news about its new Apple FaceTime competitor, Google Duo. I am in the process of installing this new app on my iPhone and testing it out. It is supposed to allow video calls between both Android and iOS devices. I do not find that it can be installed on an iPad yet however. I don't usually respond to comments in subsequent posts, but every so often the commentators raise some interesting questions. 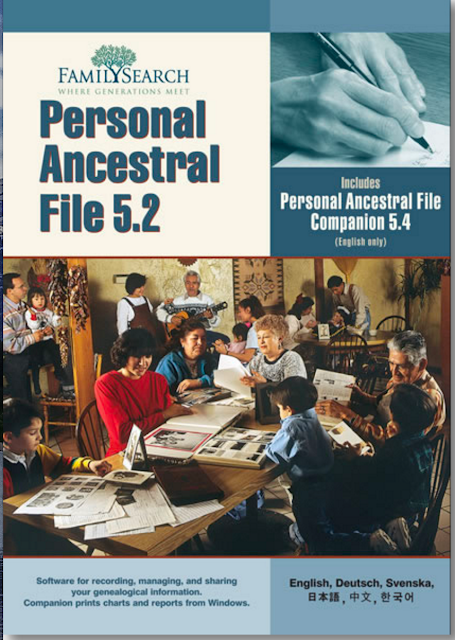 In this case, I have already had a number of long comments about my recent post on the Personal Ancestral File (PAF) program the merit a response. First, let me be very clear about my opinion about the program. The last version of the program supports GEDCOM 5.5. Version 5.2.18.0 began with an adaptation of Incline Software's Ancestral Quest program, written by Gaylon Findlay. Findlay has been involved in updates of PAF. Ancestral Quest has been developed separately, although it retains much of the basic visual layout and file structure of PAF. I left in the footnote links in case you need more information. Essentially, the updated version of PAF with all of the most recent features is the Ancestral Quest program. Which is currently available and supported by Incline Software for $29.99, in my opinion a ridiculously low price. I talked to Gaylon Findlay just a short time ago (about a week or so) and he is coming out with some new features in the near future. I will talk about Ancestral Quest when the new feature announcements are made. That said, in my experience, PAF users can make a rather seamless transition from using PAF to Ancestral Quest. So, the real issue is spending a few bucks on a major upgrade to the "free" program. The reason PAF was "free" was that it was subsidized and supported by The Church of Jesus Christ of Latter-day Saints. In fact, the boxed program was not free, it was sold for $6.00 through the Church's distribution network. The "free" copies of the program were available only as a download when the Internet finally became available as a medium for distributing software. PAF became the "de facto" standard for genealogy programs, a fact that I have always lamented. From a genealogical standpoint, the program has some serious problems and limitations. Although, at the time, it was among the best programs available given the limited storage capacity of the existing computer systems and the limitations imposed by the operating systems. Managing a large genealogy file on PAF is a nightmare. On the old computer systems, running a duplicate check, for example, was time consuming. OK, let me get down to brass tacks. I have spent a major amount of my time during the past 13 years "supporting" PAF users. When statements are made that the program is so simple that people do not need support, that is simply a fantasy. Most of the Family History Centers in existence at the time ran endless series of classes on the program. My experience in teaching those series of classes for years was that most of the users had no idea how to use the program without extensive instruction. Of course, after years and years of use, they know something about the program, but they are still coming to me and many others for "support." Fast forward to the present. We are now dealing with the FamilySearch.org Family Tree. 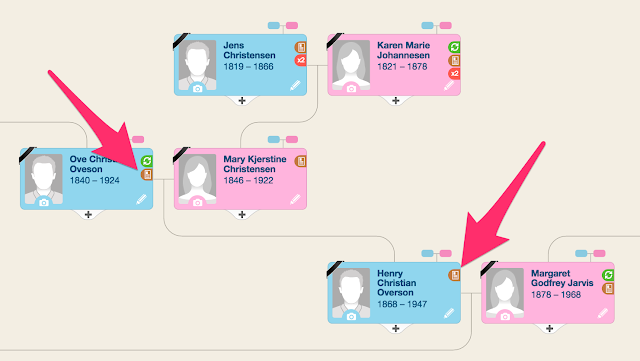 I am now getting a constant stream of complaints about the problems with the data in the Family Tree. I will show what I mean in a subsequent post, but for now it is sufficient to say that a huge number of the problems associated with the Family Tree database originate with the limitations and quirks of the PAF program. The program will continue to haunt us as long as there are people who do not recognize that the continued use of PAF is problem not a solution to any problem. Don't get me started again on GEDCOM.